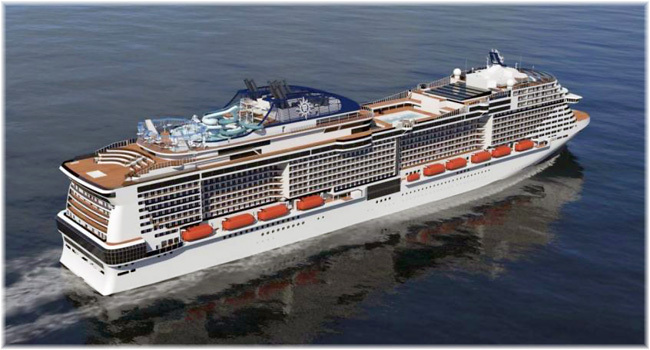 MSC Cruises To Return To The UK – Other Cruise News: Hurtigruten’s Roald Amundsen – Saga Confirms Second New Ship? Last week came news from MSC Cruises that it would be returning to the ex-UK market in 2017/18, with its 2,550-berth MSC Magnifica to be based in Southampton in 2018. 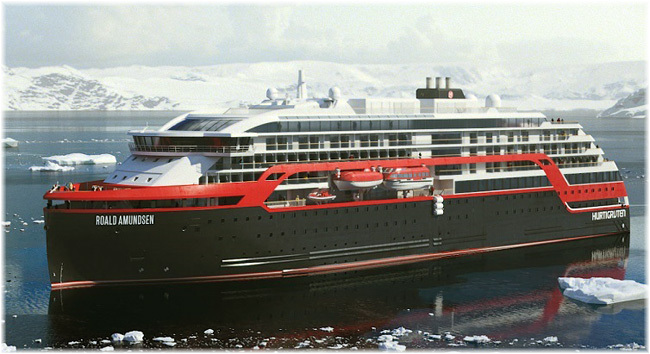 Elsewhere, Hurtigruten has announced that its new 530-berth expedition ship Roald Amundsen would be based at Punta Arenas, Chile, in 2018, while the 254-berth Fram and 600-berth Midnatsol will work from Ushuaia, Argentina. Meanwhile, Saga is reported to have confirmed a second order for a less than 1,000-berth ship from Meyer Werft in Papenburg. MSC cruises has announced that it will be returning to the UK market in 2018, when the 2,550-berth MSC Magnifica begins to offer cruises from Southampton to northern Europe and the Mediterranean. She will offer five new itineraries out of Southampton, including a 14-night Atlantic Coast cruise calling at Le Havre, La Coruña, Leixoes, Lisbon, Malaga, Amsterdam and Hamburg. A Norwegian Fjords cruise will also sail to Stavanger, Bergen, Olden and Ålesund, while a Round Britain cruise will call at Southampton, Newcastle, Edinburgh and Invergordon. With the 3,502-berth MSC Preziosa sailing from Southampton in the autumn of 2017 and the MSC Magnifica becoming the star ship for the UK & Ireland in 2018, MSC Cruises is planning a major comeback in this market. The 4,488-berth MSC Meraviglia, the line’s newest mega ship, to be christened in June 2017, will also call at Southampton, marking another important step in the return of MSC Cruises to the UK. For the 2018 season, Hurtigruten is expanding its Antarctica operation to three expedition ships, spearheaded by the new 530-berth hybrid LNG-Diesel vessel Roald Amundsen. Hurtigruten will offer tailored experiences that extend from exploratory sailings with the 600-berth Midnatsol, to nature-immersive expedition sailings for the limited number of guests that the 254-berth Fram can carry. The Roald Amundsen will sail from Punta Arenas in Chile, combining the Chilean Fjords and the Falkland Islands with Antarctica, while the Fram and the Midnatsol will sail from Ushuaia in Argentina. All Hurtigruten’s Antarctica expeditions sailing from South-America offer optional land experiences such as the Manuel Antonio National Park in Costa Rica, Machu Picchu in Peru, biking excursions through Santiago de Chile, the Atacama Desert, Patagonia, and the three-nation Iguazu Falls. The Fram will also undertake expedition voyages in the Caribbean and along the US East Coast. The destinations are spread across eight countries along the coast of Central America and include landings at ports, San Blas Islands, Fort San Lorenzo, Boscas del Toro, Puerto Limón, Corn Islands, Isla de Providencia, Cayos Cochinos and Lighthouse Reef. For the East Coast USA, Hurtigruten’s itineraries will include landings in cities such as New York and Boston. In September last year, Saga announced that it was ordering a new 56,850-ton all-balcony cruise ship that will be introduced in 2019. The new ship has been deisgned to carry fewer than 1,000 passengers in 540 suites and cabins, each with balcony. About 15% of cabins will be designed for sole occupancy and the ship will have both outdoor and indoor swimming pools. Now, according to a report by London-based BRL Shipping Consultants, Saga has firmed up its option for a second such ship from Meyer Werft in Papenburg. The ship will be yard number 715 and should be delivered in Summer 2021. Saga currently only operates two ships, the 446-berth Saga Pearl II and the 706-berth Saga Sapphire, which will eventually be phased out. Demand for sailings on the Saga ships is very high: they carried around 25,000 passengers last year, with a 75% repeat passenger rate.